Before starting up any aid pitch, study the terrain and make a plan. Determine the best rest spots, figure how to minimize rope drag, plan what gear you'll need and what you can leave for the second to carry, spot any obstructions that might plague sack hauling, and decide whether to save certain sizes of aid pieces for the end of the pitch. Fig. 11-23. The basic sequence (some equipment omitted for clarity): a, climb high; b, place piece; c, clip etrier to carabiner on higher piece; d, test, move onto new placement, remove lower etriers; e, clip rope into lower carabiner on new piece and clip in daisy chain if desired. weight with free carabiners racked in groups of four (two pairs). 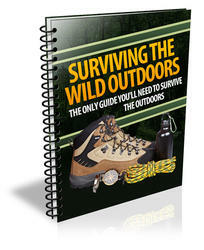 Short slings are best racked (several to a carabiner) and clipped to an easily accessible part of your harness. Finally, check that the hammer is accessible, with its sling untangled. 1. Look and feel the terrain above and select an aid piece to placc at the highest spot within reach (fig. 11-23a). the second carabiner will later take the climbing rope. Other climbers feel two carabiners get in the way at this point. If you are moving onto a pin, first attach a hero loop to the pin, and then clip a carabiner to the loop. 4. If the aid piece you are currently weighting is questionable, you may want to clip the rope to the second carabiner of the higher piece if you are positive the higher placement is solid. Otherwise, the rope is not clipped into the higher piece yet. 5. Clip your free etrier(s) to the carabiner on the higher piece (the higher of the two carabiners if you used two) (fig. 1 l-23c). If moving onto a pin, clip the etrier(s) directly into the hero loop. 6. Test the new piece with a gentle, one-footed hop (the other foot is kept in an etrier on the lower piece). If the new piece is questionable, you may decide to avoid the test and simply "ooze" onto the new placement, applying your weight as gradually and smoothly as possible. 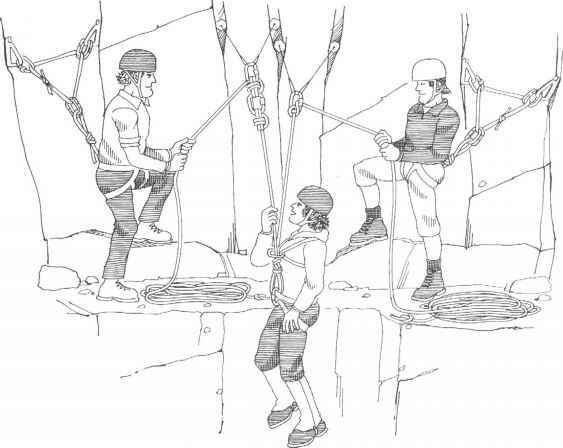 Warn your belayer when you are about to test or move onto a dubious placement. 7. Move onto the higher etrier(s) (fig. 1 l-23d). Clip the daisy chain into the new piece while in the lower step, if you wish. 8. Remove the lower etrier(s) (fig. ll-23d). For extended aid climbing, you will normally carry two pairs of etriers, so now you will remove the lower pair and clip it to your harness. (If you are climbing with just a single pair of etriers, remove the lower etrier and clip it to the highest aid piece.) Climb up the etriers until the daisy chain (or fifi hook) can be clipped in close to the new piece, if you wish. 9. Add a second carabiner (in chain fashion) to the new piece and clip in the rope. If you initially clipped two carabiners to the piece, clip the rope into the lower carabiner (fig. 1 l-23d). 10. Study the area immediately above to determine likely spots for the next placement. Then climb as high as possible, reclip the daisy if desired, and begin the process anew. Note: how high you climb in your etriers depends on the terrain, but ideally you want to place the new piece from the top step. Moving onto the top step of your etriers can be unnerving, but the ability to do so greatly improves the efficiency of aid climbing. The process is simple on low-angle rock where the top steps are used like any other foothold, and the hands provide balance. Vertical and overhanging rock makes top stepping difficult because your center of gravity moves away from the rock and above the point where the etriers are clipped to the aid placement. If the rock offers any features, your hands may provide the balance. If the rock is blank, keep your weight on your feet while leaning back and applying tension to the daisy chain between your harness and your aid placement. That tension provides the means of balancing yourself (fig. 11-24). 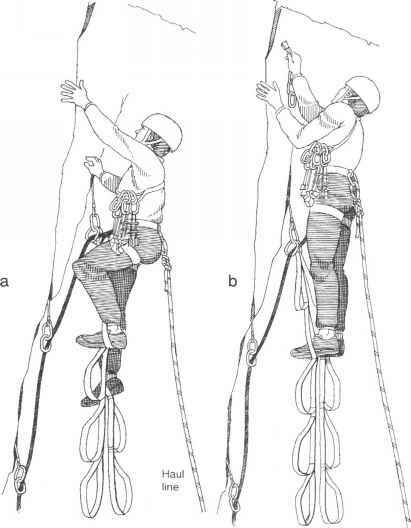 Problems encountered while aid climbing may cause you to add variations to the basic sequence. As in free climbing, rope drag can become a problem. Use long slings to keep the rope running straight. Add the slings after you have moved to the next higher piece so that you obtain the maximum gain out of each placement. You may also realize you're short of certain-sized pieces and that you will need to reuse these sizes. As you move onto a higher placement, you may opt to pull the piece you were just using and save it for future use. As a general rule, however, leave at least every other piece as your protection against a fall. Don't wear yourself out. Climb in a relaxed fashion and take rests as often as necessary to conserve your strength or plot the next series of moves. that foot under you. Most of your weight rests over the bent leg. The outstretched leg takes minimal weight but maintains balance (fig. 11-25). You can also clip your daisy chain or fifi hook into the piece supporting you and rest in your harness. rope. It also places unnecessary strain on the belay system. Finally, you can often find relaxing stances in your etriers. Generally, the greatest stability is obtained with the heels together and the toes spread apart against the rock.